I am a Southern Black Woman Playwright. To me, the Southern Black Woman Playwright brings forth the authenticity of the sum parts of its whole. The intake of breath before each word is full of the love, individuality, heat, passion, grit, church, and "I've always taken care of you and no one else will do it like I will"-ness that only the amalgam can hold. The embrace this identity, my identity, gives me is unlike any other. Its breeze follows me, flows through me, is me. And it has me forever. Administratively and creatively talented, CALLEY ANDERSON is an up-and-coming playwright from Memphis, Tennessee. Her ten-minute plays have received five festival productions to date (Emerald Theatre Company, TN 2016; Pride Theater at Chandler, VT 2017; Stable Cable Lab Co., NY 2017; InVersion Theatre, NY 2018; Fade to Black Fest, TX 2018). Anderson is a proud graduate of Memphis Central High School and Davidson College, where she received her BA in English with a Concentration in Film and Media Studies. Post graduation, Anderson spent three years in the Memphis non-profit arts sector. She first served as the Programs Coordinator for Hattiloo Theatre, one of four black repertory theaters in the country. During her time at Hattiloo, Anderson fulfilled additional roles — Interim Managing Director, Stage Manager (If Scrooge Was a Brother, The Wiz), Assistant Production Manager (If Scrooge Was a Brother, Hoodoo Love, King Hedley II, Purlie Victorious), and House Manager throughout Hattiloo’s ninth and tenth seasons. After completing her tenure at Hattiloo, she served as the Diversity & Inclusion Manager for the Memphis Symphony Orchestra during their 2017-2018 season. Following this, Anderson moved to New York City to pursue her Master's degree in Playwriting. She is currently in her second year at The New School - School of Drama. Yet, she has not strayed far from her non-profit sensibilities—she spent the past summer and part of her Spring semester interning in the Marketing & Communications department at EmblemHealth in New York City. Her influence expands beyond her page-to-stage activities. Anderson is one of thirteen Memphis Hub fellows of the Salzburg Global Seminar's Young Cultural Innovators, having attended Session IV Forum at the Schloss Leopoldskron in Salzburg, Austria in October 2017 and the second US regional Hub meeting in New Orleans in April 2018. She was an inaugural Facing Together Ambassador for Facing History and Ourselves - Memphis, as well as an inaugural training facilitator for the Memphis Grizzlies TEAM Up Youth Mentoring Partnership before leaving Memphis for New York. Anderson is a current member of the Dramatists Guild through the First Year Out Program and one of two co-facilitators for the New School for Drama's Artists of Color Affinity Group. 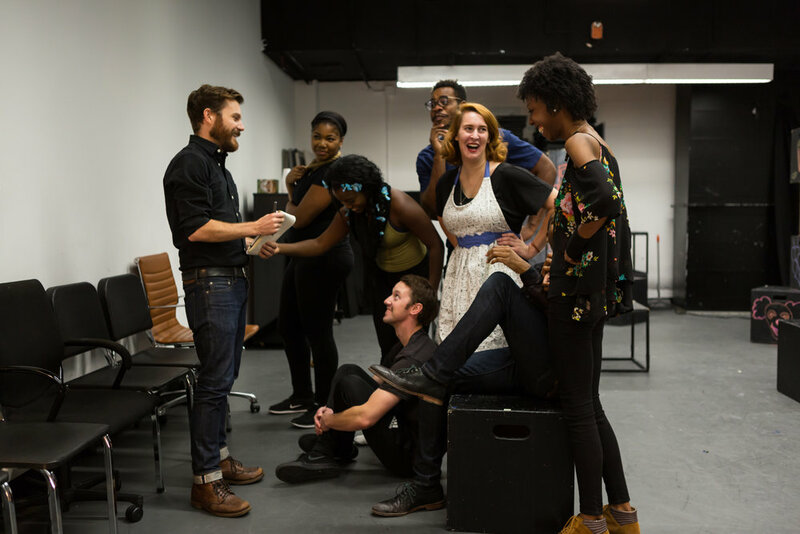 The 'Hell is Normal' rehearsal process is featured in this blog post by The New School. Calley is featured in an article about Emerald Theatre Company's inaugural 10-minute play festival. Click here to read excerpts of calley’s work via New Play Exchange. Does a spark always start a fire? Or can it die out? In this 10-minute play, two young men engage in a tête-à-tête about truth, self, and love at a lonely airport baggage claim. Students in the Tech and Performance CoLab bring together principles of interactive design, storytelling, and performance.